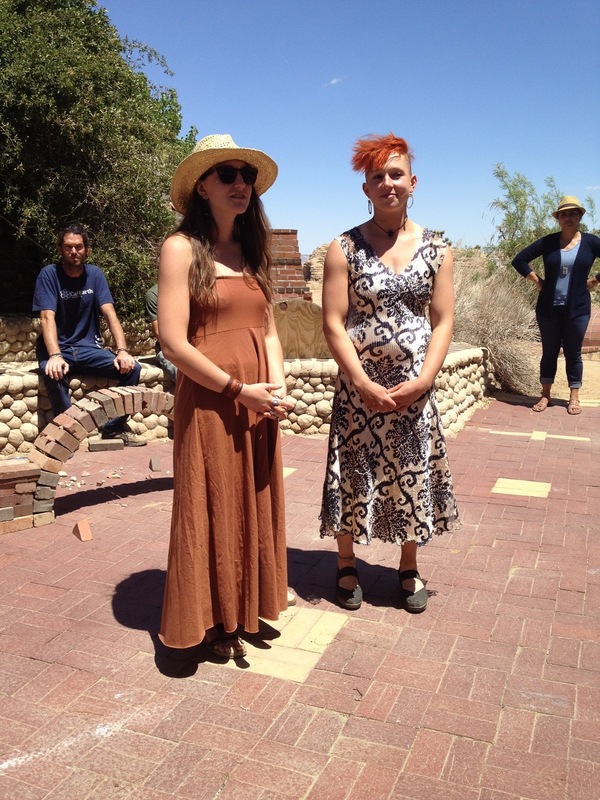 By using our background in fine art and knowledge of Superadobe, alumni Laura Smith and I created a sculpture garden at the California Institute of Earth Art & Architecture. We wanted pieces that foster community, interaction, and conversation. Our series of site-specific works were made from the Cal-Earth technology of earthbags, but pushed the flexibility of the bag, shapes, and forms. 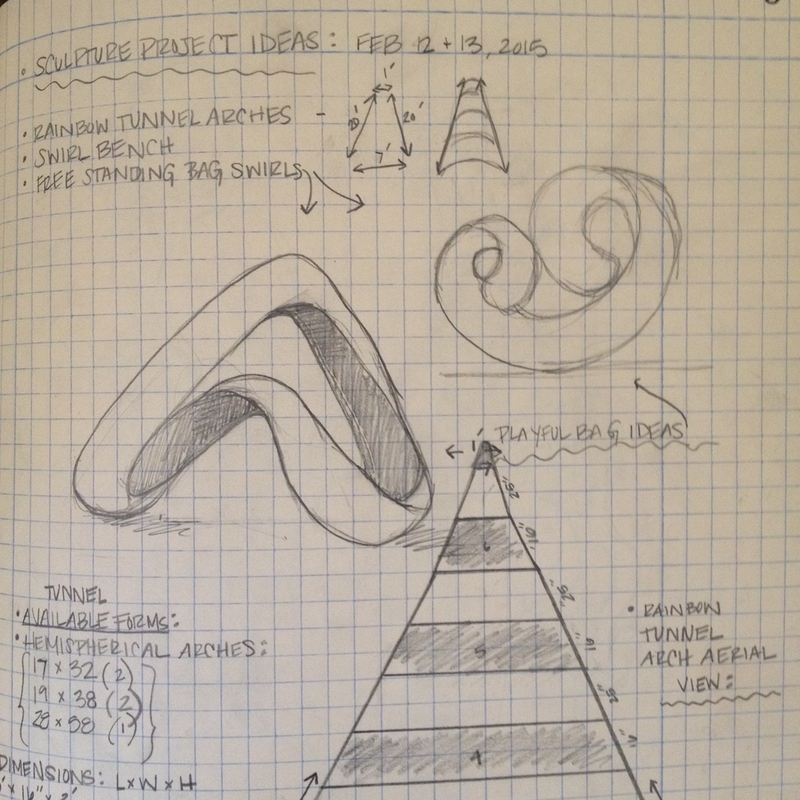 We wanted to explore what the earthbag is capable of, and inspire others to see this earth architecture can be simultaneously playful and functional. 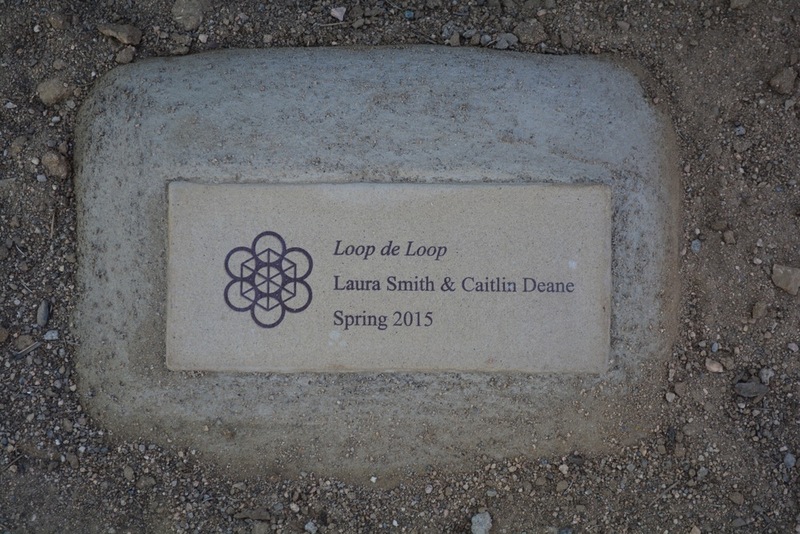 Our sculpture garden idea was a long time coming, as Laura and I conceived of it when we first met back in the spring of 2013. I was finishing my R&D DIY window project with Brandon Evans and she was just beginning her first apprenticeship. 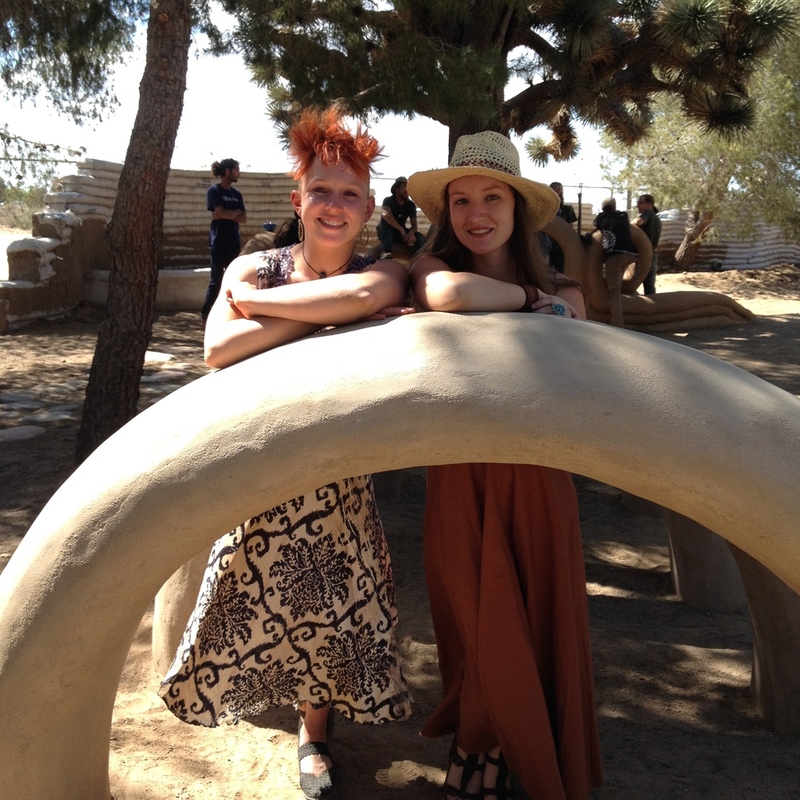 That autumn we both worked together on the first Cal-Earth Long Term Vault Program with three other peers, and built a 12x24 freestanding Superadobe vault in 12 weeks. 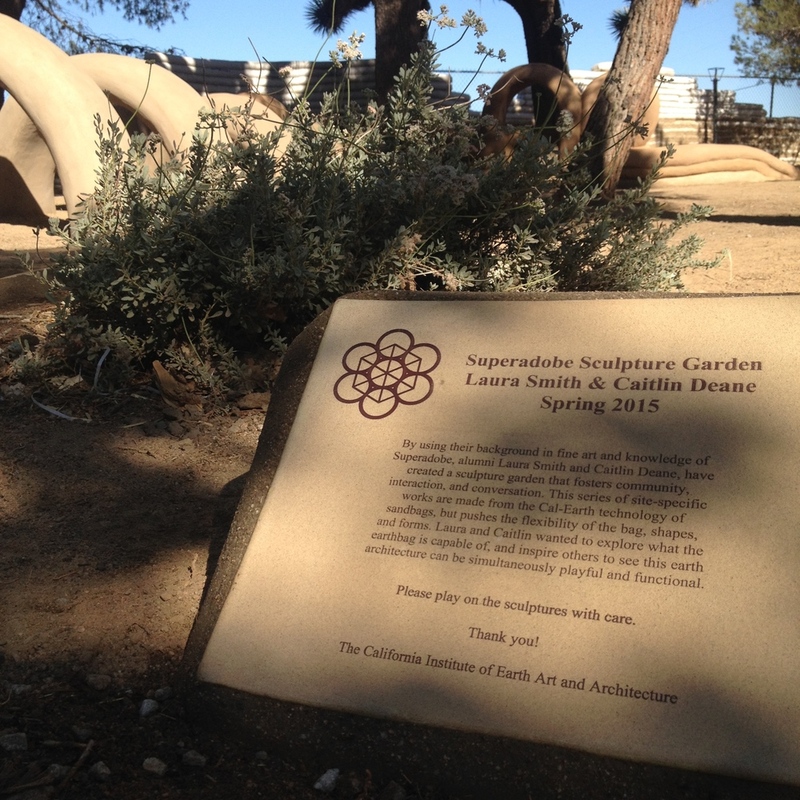 That program really showed how well we worked together and how similar our ideas were for Superadobe sculptures. 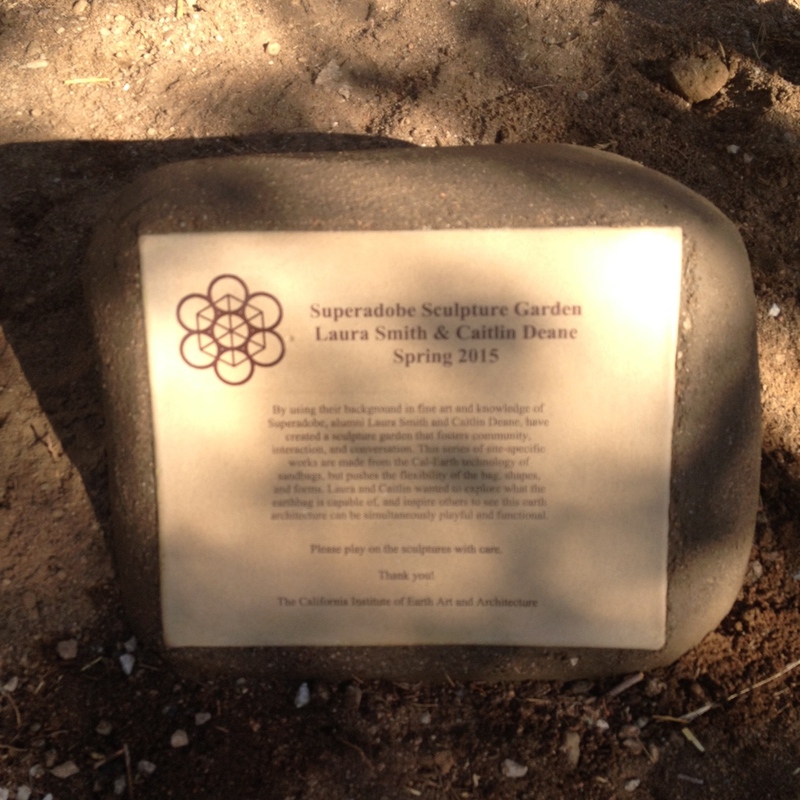 We started brainstorming the idea of a site-specific Cal-Earth sculpture garden in the fall of 2014 via Skype, Facebook, and email as Laura was finishing up projects abroad. We really wanted pieces that kids could touch and be encouraged to play on. Laura and I pitched the 12 week sculpture program idea with a timeline, budget, and sketches and it was a go! We wanted to treat our program like any other art residency program, so we did our best to be clear with our intentions for the space. Once we both gathered in the proposed site, we made clay models, revised budgets and timelines, and started sketching on the ground. Laura worked on mathematical 2D sketches of our final three ideas to scale, and I worked on artist sketches in perspective with the surrounding trees. 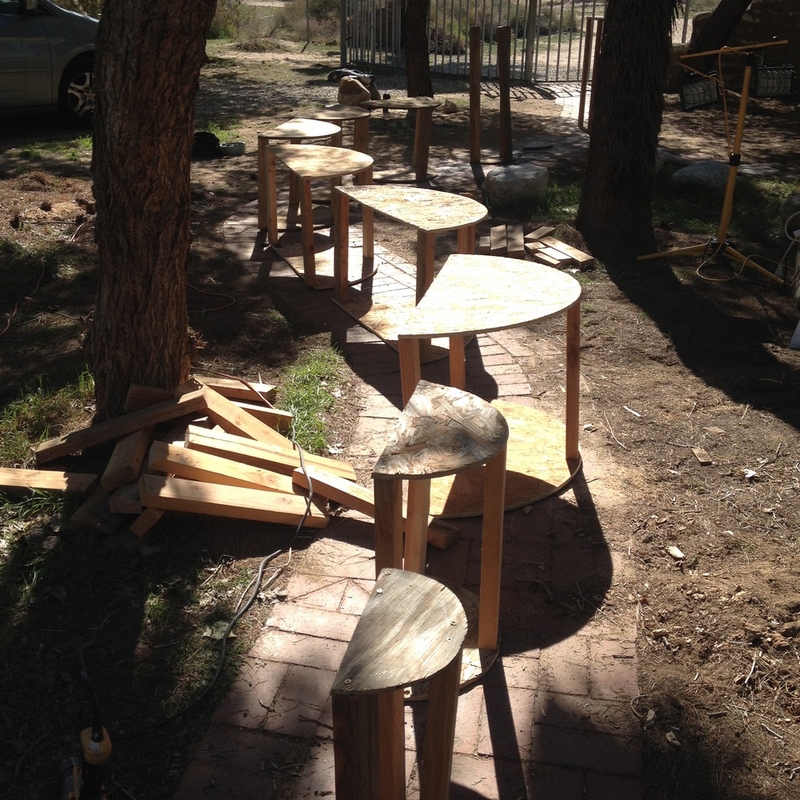 By week two in February 2015 we had settled on our ideas and started working on wooden forms, forms, and more forms. To make a positive shape, you need to visualize and calculate the negative shape. 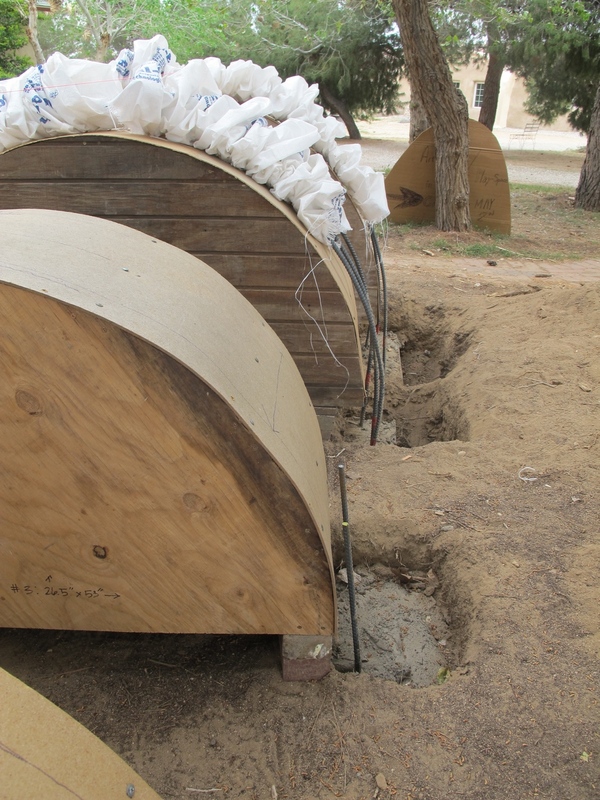 Superadobe bags form to what is around it, like a mold, so we got creative with making decreasing hemispherical arches, catenary arches, and circles that would become sandbag swirls! All new forms were made from older recycled forms on site as well as broken bed frames from student housing. Our goal was to keep this project sustainable and affordable by using as many reclaimed materials as we could find and only purchase new necessary items. Once all the forms were finished, we started digging! 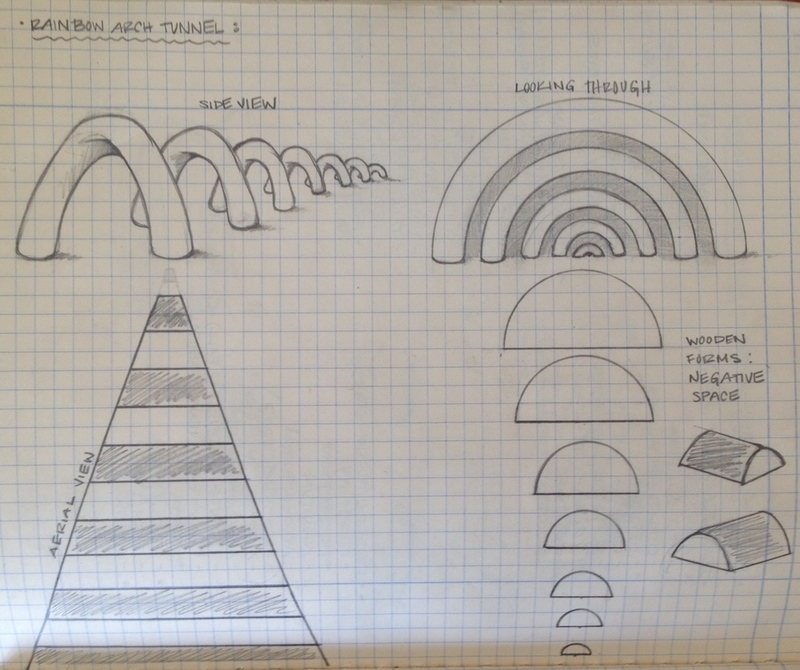 For our first piece “Earthrise,” my idea was to celebrate geometry and echo forms in nature, such as the rainbow. I envisioned a playground akin to monkey bars where kids could climb on and into the tunnel of decreasing arches, which created an optical illusion. 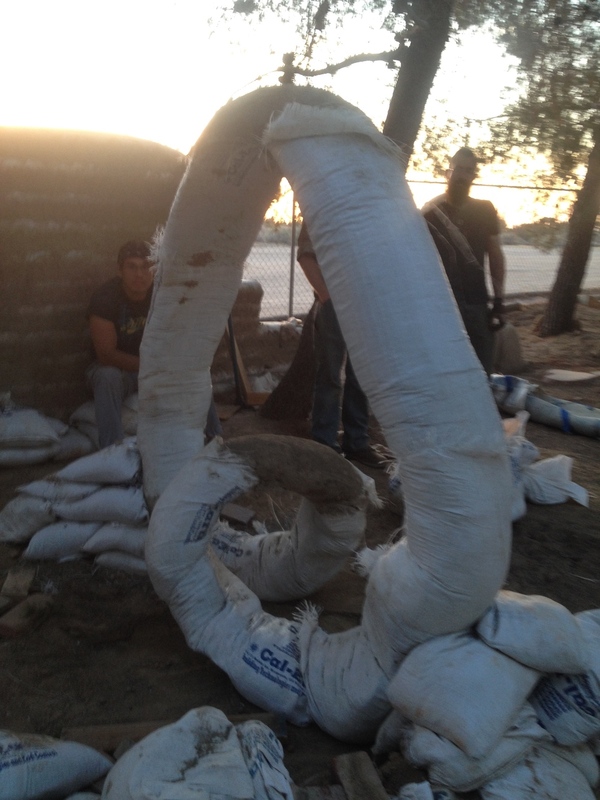 We sank each bagged arch into the ground 1.5' to 2’ deep, speared onto 2-3 pieces of rebar cast in concrete. Brandon taught us how to bend rebar into arches by hand so that we could imbed the two largest arches with two full pieces and hand pack the arches with mix. This way, the arches could withstand any movement forced onto them, such as a child pushing from both directions. We wanted these pieces to be as safe as possible, so we also added gravel, Portland Cement, and extra rebar where we could. Bagging such large arches was no easy feat, as they have the tendency to sag towards the ground and start out large and get smaller, thus resulting in an uneven arch form. By the fourth of seven arches, we came up with an easy technique of using a long 2x4 to prop up the bag as leverage to accurately spear it onto the rebar. Most times we needed more than two people, so we looked to the on-site apprentices for help when we could. 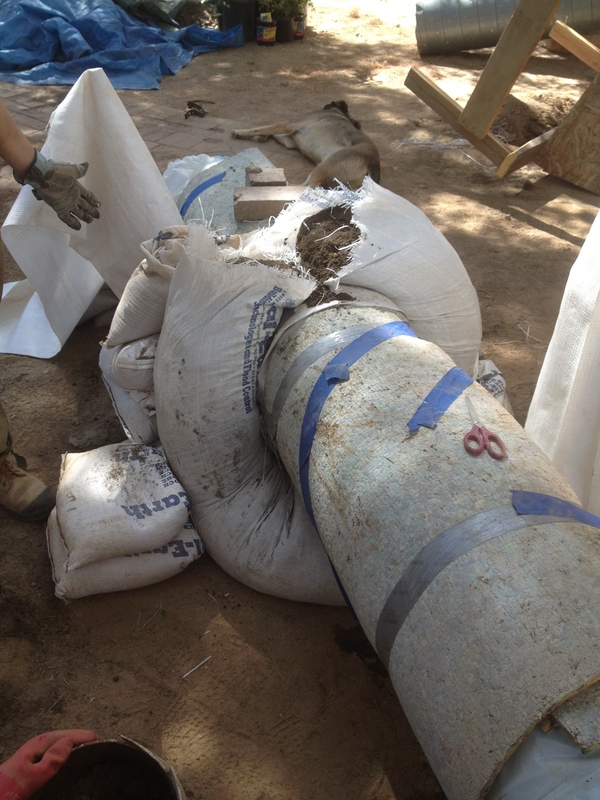 We added wire mesh to make up for the unevenness of the bags and did several coats of rough plaster. For our finish coat, we used Lehigh Type 1 White Cement with varying shades of La Habra Stucco Color Additive. We bought four different colors but ended up using the “Clay” color and did small test tiles to properly ratio how much color to how much cement. We decided on making the largest arch pure white cement and earth decreasing in brightness to the smallest arch with white cement, earth, and the most saturated dark grey. The texture was troweled with a sponge finish with a little grip for safe climbing. We battled uneven drying due to a freak spring storm with 35mph winds, but still managed to come away with a fine plaster job, where my partner Toby Verhines helped every step of the way! For our second piece, “Loop De Loop”, Laura’s idea was to create two parallel lines in space alternating their movements, like tides and waves of the ocean spilling onto the next one. 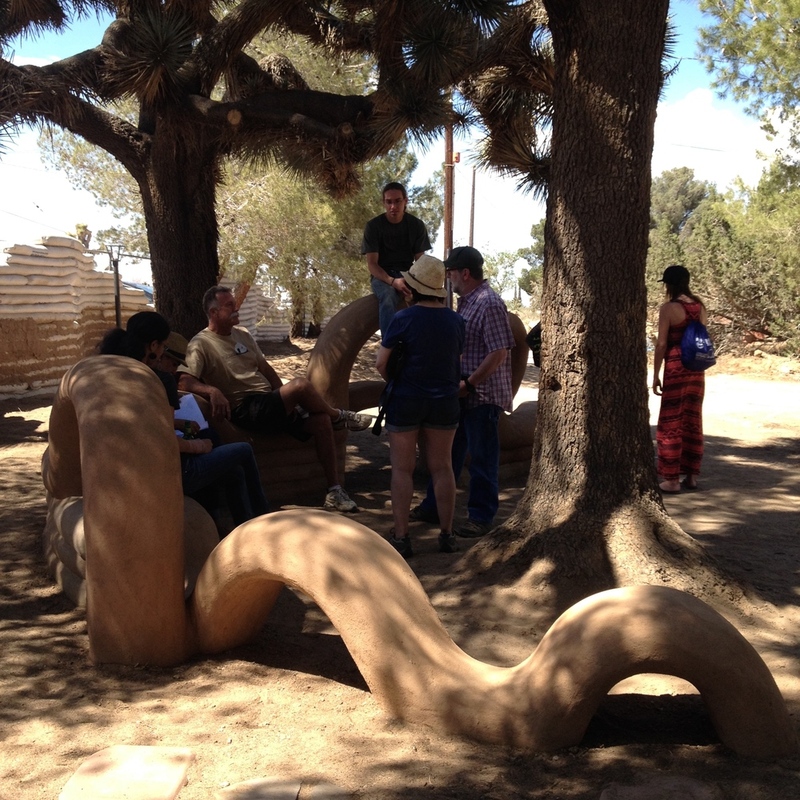 We both wanted it to act as a bench and be functional as a social arena for conversation and relaxation. 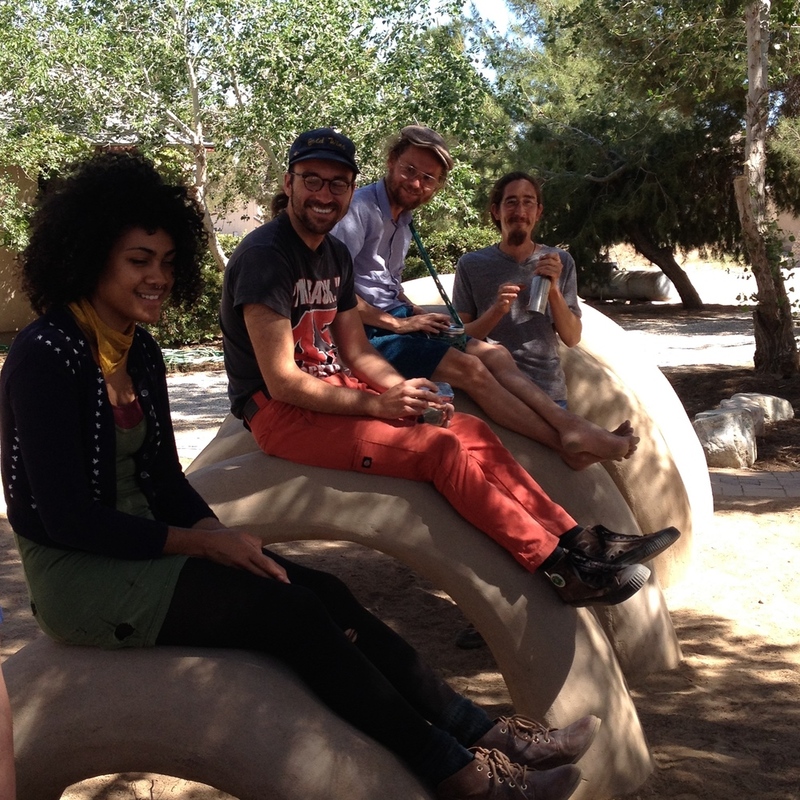 We built it curving around an existing Joshua Tree, coming off of “Earthrise” as a jumping off point. It also interacts with a pre-existing bench area attached to a retaining wall on the west side of the campus. 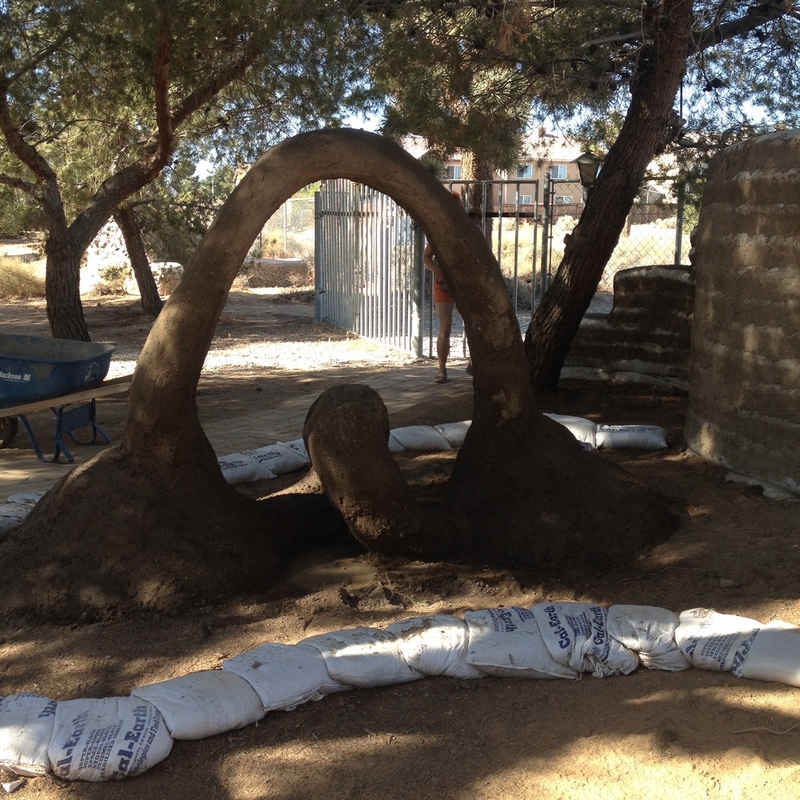 This piece truly pushes the flexibility of the earthbags, as Laura wanted a Superadobe swirl as the final period on a sentence of varying arches. The sketch and idea was elegant, the creation of it, not so much. Our first attempt of the swirl broke due to a improperly placed cold joint, and not enough rebar support. The second go around was a success and as it’s been said around site, “It builds character to take down a few rows on a dome.” The finish coat of plaster also includes white cement and pigment, where the bottom rows are pure white and the two top bags utilize a warm earth orange colorant with almost complete saturation of the materials. Our third and final piece, “Archaos” is true to it’s name. 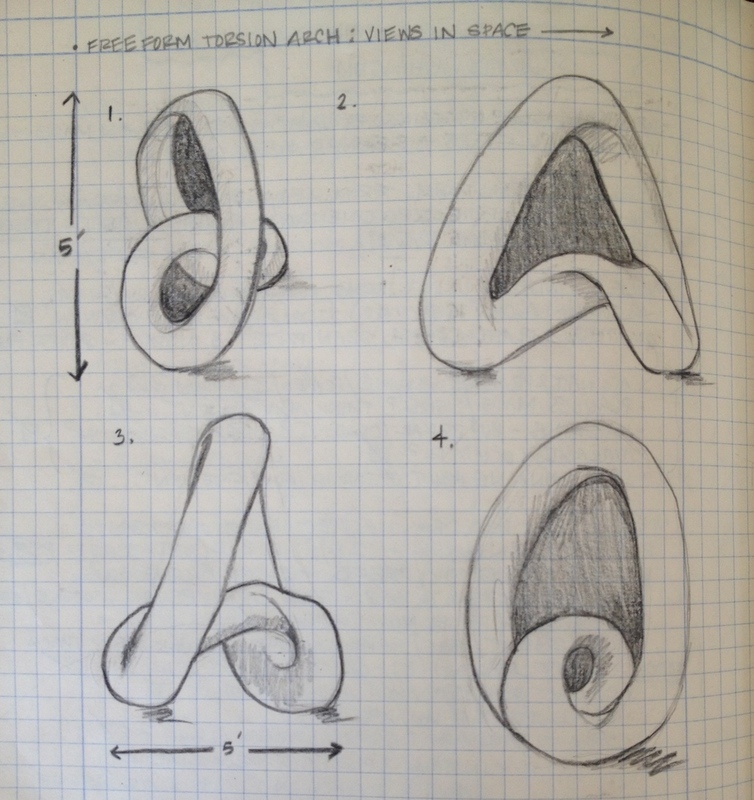 ; A chaotic free standing single-bag sculpture twisting and turning with no end and no beginning. This piece was based on a shape Ian Lodge, Cal-Earth’s Site Director, had seen and wanted to replicate in bag form. For this piece, we constructed a catenary arch by tracing a long chain and built it with accompanying 2x4 legs. 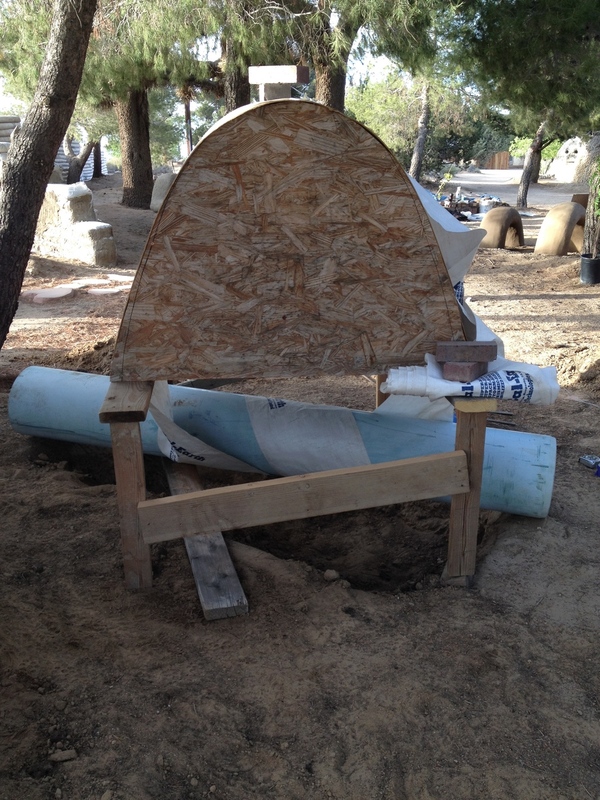 For the bottom arch, we had a bag curve around a cushioned blue irrigation pipe. We cast rebar into the ground to attach it to the earth and also added in Micro-rebar in the mix, essentially tiny pieces of twisted metal rods that act as support. 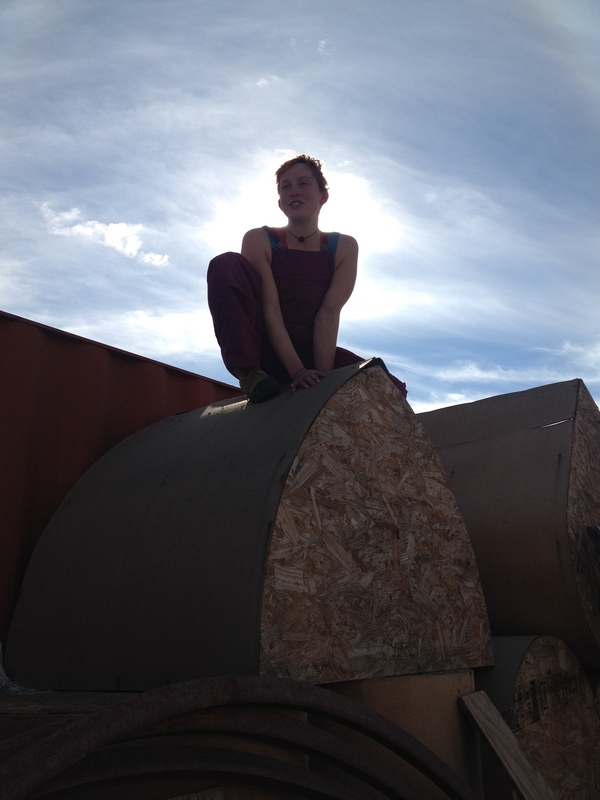 Upon form removal, the piece slumped in place with risk of falling. 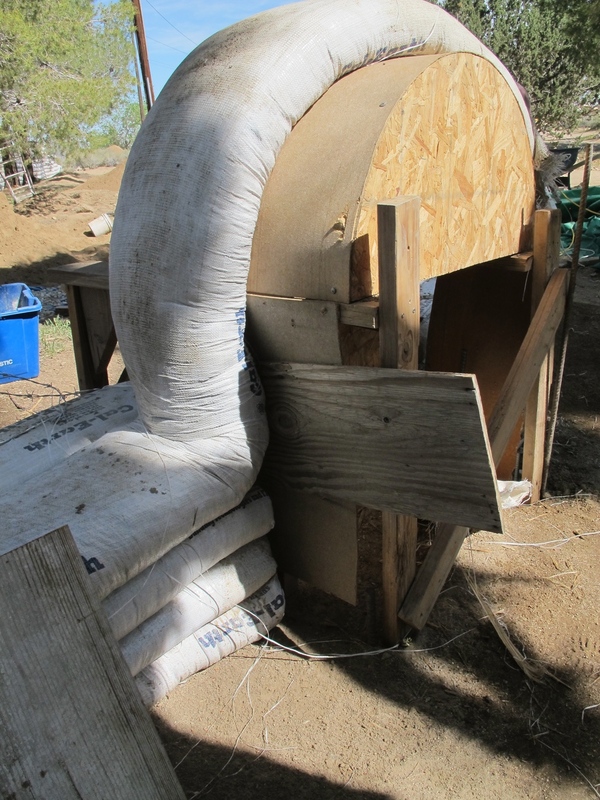 We added single sandbags as buttresses, resulting in a bulkier shape. Although this piece didn’t go as planned, we learned A LOT from the process. 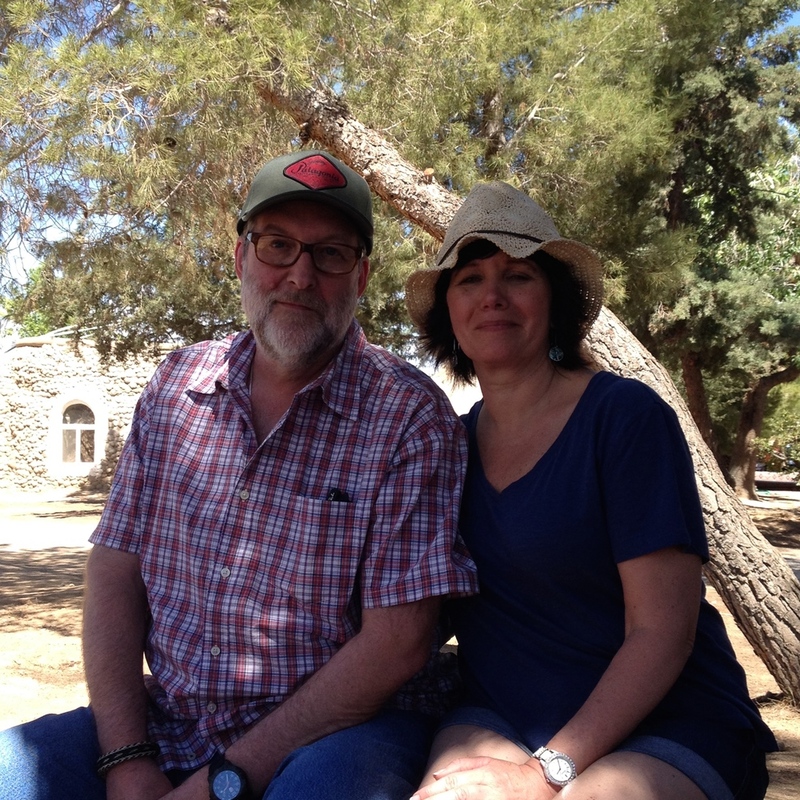 It is currently a work in progress and both Laura and I are headed back to Cal-Earth in November 2015 to finish it! As for signage, I utilized MazAmar’s process of iron oxide transfers to create permanent ceramic signs for each piece and the sculpture garden as a whole. 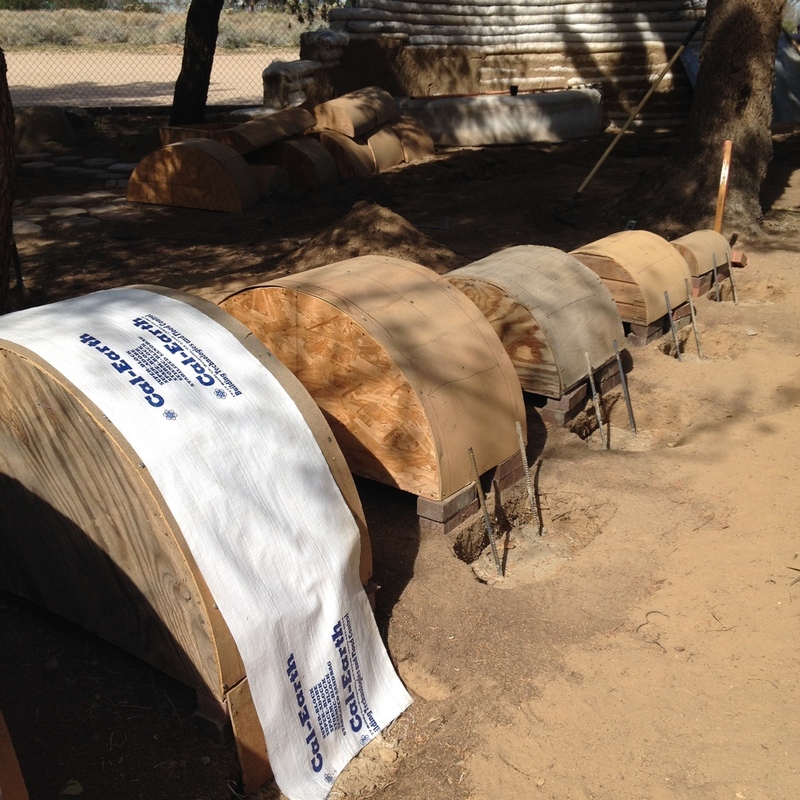 After firing the tiles, I coated them in three layers of Helmsman Water Sealant which includes a protective UV agent and prevents against fading and sandblasting in the high desert sun and winds. I inlaid the fired ceramic tiles into sandbags and plastered around them. Through this program, we learned the hard way that if we were to make more pieces in the future, we would need at least a group of 5 to execute the projects effectively. 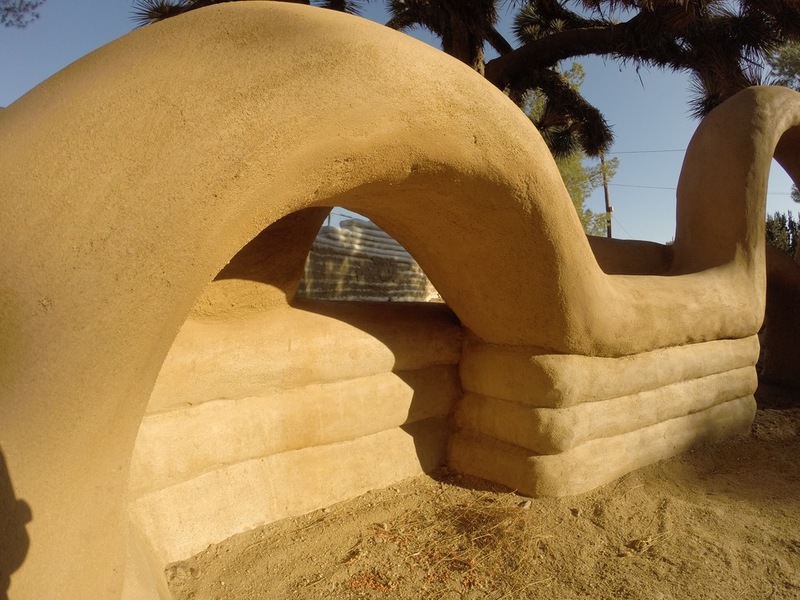 Community is INHERENT in Superadobe as well as other natural building techniques in general. Tribes and villages would gather and make each other’s houses together and repair them after the rainy seasons. 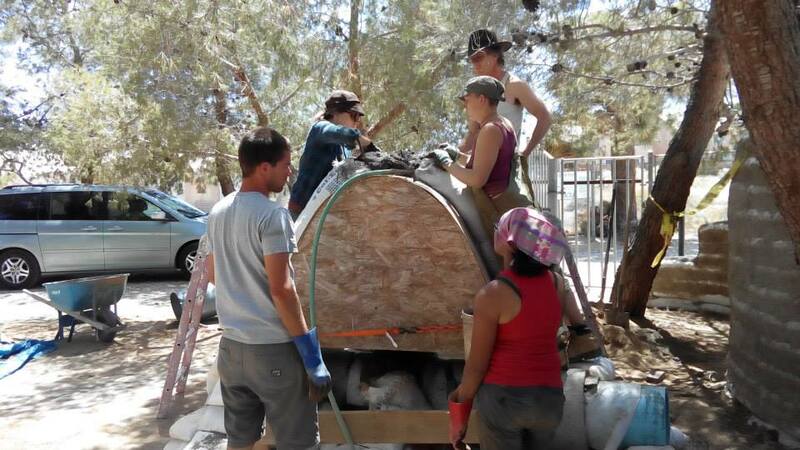 This work is not easy and often includes heavy physical labor with the support of one’s friends and/or family. I am so grateful for the help of the many teachers and apprentices on site, previous alumni, my partner Toby, and of course my creative partner, Laura Smith. For the opening reception, my parents flew all the way from the east coast to surprise me for 24 hours! It was one of the best days of my life and I couldn’t be more happy with the current place I am at in my life. This project to me, was the culmination of my MICA Senior Thesis from 2012 plus my new love of earth building made into reality. 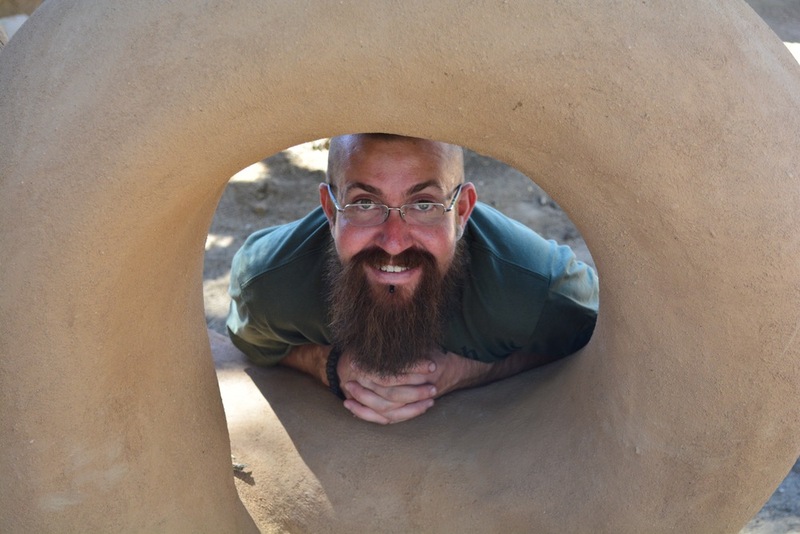 I had always dreamed of creating larger than life earth sculptures, and I feel that by learning these and more earth building techniques, I can execute my ideas successfully. I anticipate on learning rammed earth, cob, straw bale, and more natural plasters in the future to enhance the flexibility of my ideas. If anything, this work has taught me perseverance and to deeply surrender to what is. The times when I struggled and had no idea which direction to go, the art would tell me what it needed and gave me answers to all of my questions. So many parallels came up between the pieces and my personal life that were too hard to ignore, like gentle nudges in the right direction. This place took a big piece of my heart from the minute I stepped through the gate almost three years ago. What a journey it has truly been and I look forward to keeping my hands dirty and close to the earth. Thomas Ballandras, Beau Baconguis, Brandon Evans, Sheefteh Khalili, Dastan Khalili, Ian Lodge, Wade Lucas, Florent Moisan, John Orcutt, Jerry Peterson, Dan Soto, Crystal Torres, Emine Turan, Toby Verhines, Dave Walker, and Nathan Wright. We wouldn’t have been able to finish without each and every one of you! 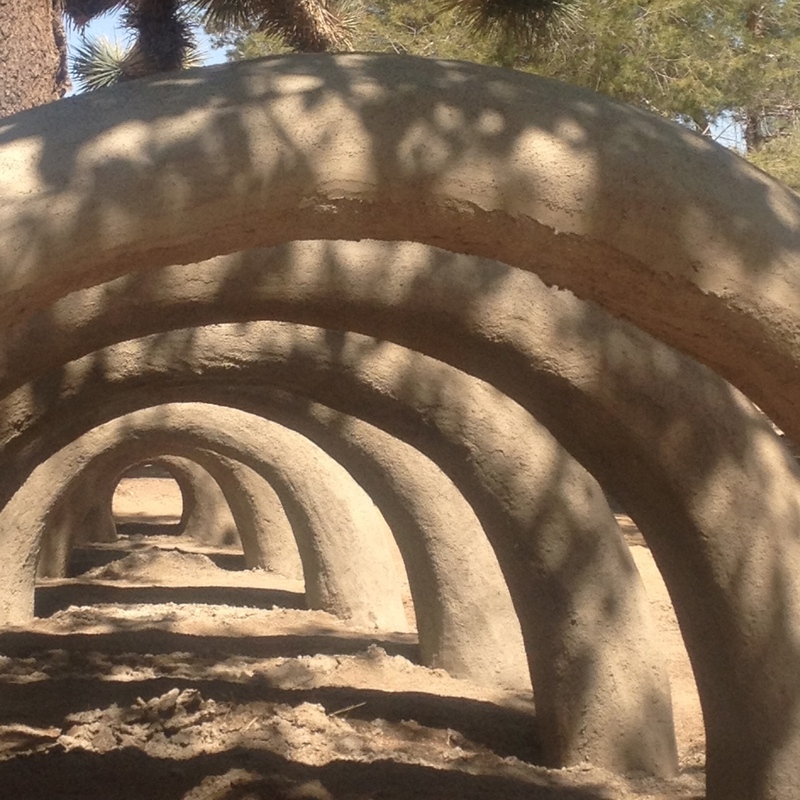 For more photos of my finished pieces from the Superadobe Sculpture Garden, visit my Earthworks gallery. To visit Cal-Earth, schedule a tour or see a list of public Open House dates at www.calearth.org.